S.E.A.L. 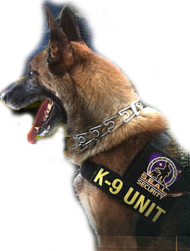 Security Texas offers K-9 security services for a variety of situations including detecting drugs, explosives, and weapons; special event patrols; and tracking/apprehending suspects. Our K-9 teams consist of professional handlers and specially trained German shepherds. Together with our highly qualified security officers, these dogs are an extremely effective deterrent against crime. As with all of our security offerings, S.E.A.L. 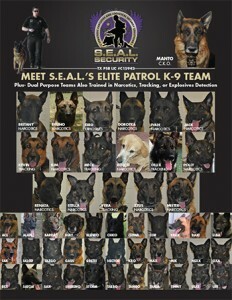 Security Texas K-9 security services can be customized to best meet your security needs. Whether you need a strong visual deterrent, a one-time security sweep for drugs or explosives, or a comprehensive security solution that blends K-9 patrols with other security services, we’ll ensure that you always get the support you need and demand.